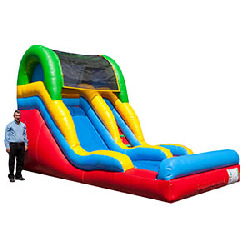 A great dry slide for small kids or you can order with the ''wet'' option and make it a water slide, fun for all ages! The six-foot tall slide platform is covered with a safety netting to prevent jumping and the slide is protected with high inflatable walls and bumpers. Can be used dry or wet. If wet, client must provide garden hose, to the setup location, with continuous water.